From the predictions page you have the option print reports of Jupiter events over any selected range of dates. When you click on the Monthly Report button a small panel like the one below will appear. The report start and end dates are self explanatory. Include Hour Angle will add a line below each event in the report showing the Hour Angle of Jupiter for the given time. Io Related Events Only will exclude events in which the mode name does not include "Io". In other words, non-Io related events will not be displayed in the report. Io related events are the most dependable and often observed. 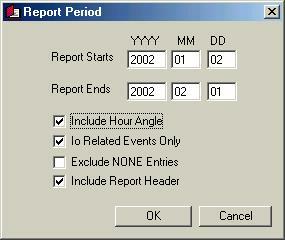 Exclude NONE Entries will prevent the report from listing entries for modes where no event takes place. If you do not check this box then a line will be included for every mode and those modes that are not active on that day will have the word NONE shown on their line in the report. Include Report Header includes information at the top of the report linking it to the observers location.